Apple has released a small but critical update for the iPhone, iPad, and iPod touch, versioned as iOS 7.0.6 with a build number of 11b651. 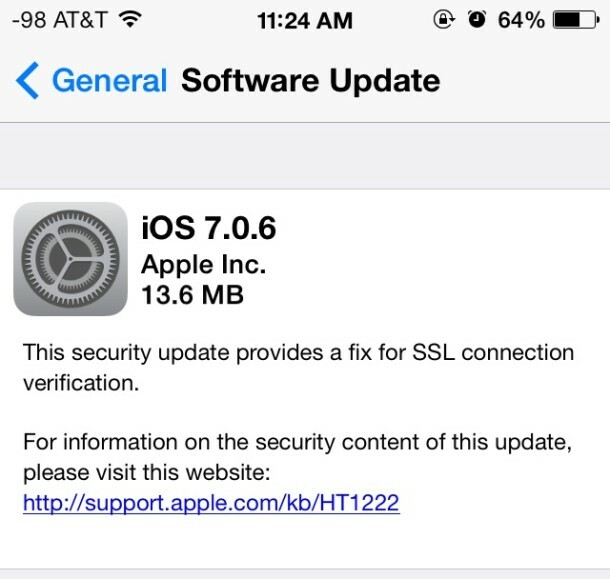 The security update notably includes an important fix for SSL connection verification, and weighs in between 13MB and 36MB, depending on the iOS device being installed upon. This update should be installed on all compatible devices as soon as possible. In simple terms, that means this security update prevents a potential threat of a specific man-in-the-middle attack. Well, as usual with a tiny update, it turns on BLUETOOTH when you have it turned off. So remember to turn that back off if you notice your battery eating it down. Why can’t Apple fix that? HDR turning itself off bug is still around too. Annoying. Does this ‘security fix’ prevent the GBA emulator from installing through iOS Safari? Maybe it patches the jailbreak too? Those are my two guesses, oddly quick release of a security update that is otherwise inconsequential given the enormous amount of bugs with iOS 7. GBA4iOS still runs on my iPhone just fine after installing iOS 7.0.6 update, but have heard reports of it no longer installing. Battery life seems to be worse with iOS 7.0.6. Am I crazy? Battery life seems much worse for me after updating to iOS 7.0.6 too, very odd if the update is supposedly only an SSL fix, huh? I have the same issue with battery drainage after 7.0.6 update. Approx 15% per hour when in standby. Battery drain is shocking. 15% per hour is very close. Your Apple TV will offer to install the update also. An chance 6.16 will work on an iPhone 4? I’m still on 6.0. Battery life is horrible on my 5 after update. Will go from 50% to 20% within literally 2 minutes and only face book running. Closed everything else. No wifi or Bluetooth on. Original 5 so maybe battery finally gave out but didn’t happen til after update. I too am experiencing battery drain on my Iphone 5 since the update. I’m really getting sick of this, Apple fix the problem because I will change to Samsung if this continues. I also experienced the crazy fast battery draining on an iPhone 5 post iOS 7.0.6 update. It was very easy to fix, so I’ll do a quick write-up which hopefully will help everyone else too, stay tuned. I’ve had battery problems for the past week and nothing seems to improve it. I’m always coming back home wih a drained 5s from work. Any details in how you got around this will be very beneficial. What if we have a retina iPad but don’t want to “upgrade” to iOS 7? Any option for us? Probably nothing easy. Stay tuned for the press conference from apple talking about the “unprecedented” uptake of iOS 7. I can guarantee that number will include a lot of unwilling adopters.